The purpose of this section is to educate you about the different types of skin cancer, their causes, and preventive measures you can take; to help you know when to consult a doctor; and to explain the role of the plastic surgeon in the diagnosis and treatment of skin cancer and other skin growths. The primary cause of skin cancer is ultraviolet radiation -most often from the sun, but also from artificial sources like sunlamps and tanning booths. In fact, researchers believe that our quest for the perfect tan, an increase in outdoor activities, and perhaps the thinning of the earth's protective ozone layer are behind the alarming rise we're now seeing in skin cancers. By far the most common type of skin cancer is basal cell carcinoma. Fortunately, it's also the least dangerous kind--it tends to grow slowly, and rarely spreads beyond its original site. Though basal cell carcinoma is seldom life-threatening, if left untreated it can grow deep beneath the skin and into the underlying tissue and bone, causing serious damage (particularly if it's located near the eye). 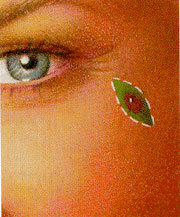 Moles are clusters of heavily pigmented skin cells, either flat or raised above the skin surface. While most pose no danger, some-particularly large moles present at birth, or those with mottled colors and poorly defined borders-may develop into malignant melanoma. Moles are frequently removed for cosmetic reasons, or because they're constantly irritated by clothing or jewelry (which can sometimes cause pre-cancerous changes). Basal and squamous cell carcinomas can vary widely in appearance. The cancer may begin as small, white or pink nodule or bumps; it can be smooth and shiny, waxy, or pitted on the surface. Or it might appear as a red spot that's rough, dry, or scaly...a firm, red lump that may form a crust...a crusted group of nodules...a sore that bleeds or doesn't heal after two to four weeks...or a white patch that looks like scar tissue. Malignant melanoma is usually signaled by a change in the size, shape, or color of an existing mole, or as a new growth on normal skin. Watch for the "ABCD" warning signs of melanoma: Asymmetry-a growth with unmatched halves; Border irregularity-ragged or blurred edges; Color-a mottled appearance, with shades of tan, brown, and black, sometimes mixed with red, white, or blue; and Diameter- a growth more than 6 millimeters across (about the size of a pencil eraser), or any unusual increase in size. Squamous cell carcinoma may begin as a red, scaly patch, a group of crusted nodules, or a sore that doesn't heal. 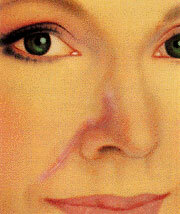 Most skin cancers are removed surgically, by a plastic surgeon or a dermatologist. If the cancer is small, the procedure can be done quickly and easily, in an outpatient facility or the physician's office, using local anesthesia. 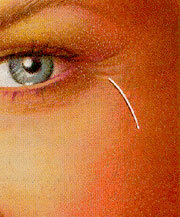 The procedure may be a simple excision, which usually leaves a thin, barely visible scar. Or curettage and desiccation may be performed. In this procedure the cancer is scraped out with an electric current to control bleeding and kill any remaining cancer cells. This leaves a slightly larger, white scar. In either case, the risks of the surgery are low. Small skin cancers can often be excised quickly and easily in the physician's office. If the cancer is large, however, or if it has spread to the lymph glands or elsewhere in the body, major surgery may be required. Other possible treat- ments for skin cancer include cryosurgery (freezing the cancer cells), radiation therapy (using x-rays), topical chemotherapy (anti-cancer drugs applied to the skin), and Mohs surgery, a special procedure in which the cancer is shaved off one layer at a time. (Mohs surgery is performed only by specially trained physicians and often requires a reconstructive procedure as follow-up). All of the treatments mentioned above, when chosen carefully and appropriately, have good cure rates for most basal cell and squamous cell cancers -and even for malignant melanoma, if it's caught very early, before it's had a chance to spread. You òld discuss these choices thoroughly with your doctor before beginning treatment. Find out which options are available to you...how effective they're likely to be for your particular cancer...the possible risks and side effects...who can best perform them...and the cosmetic and functional results you can expect. 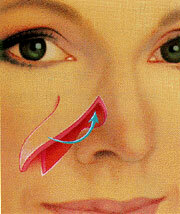 If you have any doubts about the outcome, get a second opinion from a plastic surgeon before you begin treatment. Your physician, however, can't prevent a recurrence. It's up to you to reduce your risks by changing old habits and developing new ones. (These preventive measures apply to people who have not had skin cancer as well). On any exposed skin, use a sunscreen with an SPF (sun protection factor) of at least 15. Reapply it frequently, especially after you've been swimming or sweating.